To ensure that your film to DVD transfer achieves the best possible quality, cleaning and conditioning your film prior to transfer is crucial. Cleaning and prepping your film for transfer can be a time-consuming process, but will ensure optimal transfer quality. There are actually several different factors that can lead to quality issues of 8mm film. Some of the damage your film has endured over the years can be carefully remedied, while others may not. Inspecting your film prior to transferring can help you to identify problems with the film before you even start transferring. Inspecting the film can be done with a trained eye, or by loading the film onto a projector to see what the quality is. Although scratching and wavy lines running through the film are fairly common, it is not the most serious issue that can be present in old film. Film which has been left for long periods of time in humid environments such as coastal or tropical regions tend to develop mold, mildew or other types of fungus. Typically, the mold will start on the outer edges of the film and grow inward toward the emulsion. These types of mold have a distinct smell and looks like a white powder around the edges of your film. Mold, if left untreated, will inevitably lead to the deterioration of your film. If the mold growth is isolated in the outer edges, a thorough cleaning can stop its progress before it gets to the emulsion. There are chemicals available to get rid of these microorganisms from the emulsion but it usually erases the images as well… So it’s best to use a non-abrasive silicon cleaning cloth to remove any dirt, dust and mold prior to a film transfer project. 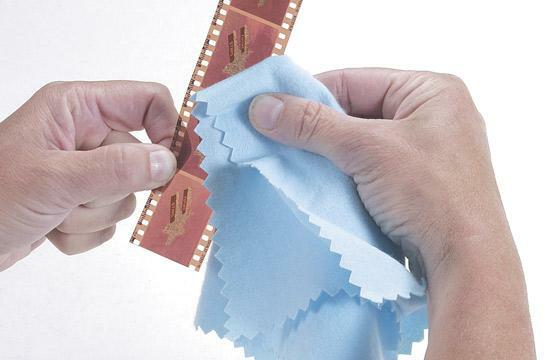 Shrinkage should be measured before you can have the film transferred to digital format. 0.8% to 1% shrinkage carries the possibility that your film will be further damaged if you load it on a projector. 2% shrinkage virtually renders transfer impossible even with the best labs. To measure shrinkage, a Shrinkage Gauge is used but you can also do it manually by comparing 100 frames of the film to 100 frames of new film.